German Shepherds in Terminator? Yep, in fact, in the Terminator movie series, German Shepherds play a pretty important role too, though you may not have really been aware of it. Dogs in general will bark as these alien creatures, the terminators, approach. As a result dogs are wonderful guardians and protectors in alerting their human families to the existence of a terrible impending danger in the detection of terminators. In the original Terminator movie you often see dogs, such as the German Shepherd Dog, barking as the terminator (Arnold Schwarzenegger) approaches. In fact, Wolfie the German Shepherd, owned by the director of the film, James Cameron, can be seen barking at the terminator in the Motel scenes as the terminator searches for Sarah and Kyle later on in the film. 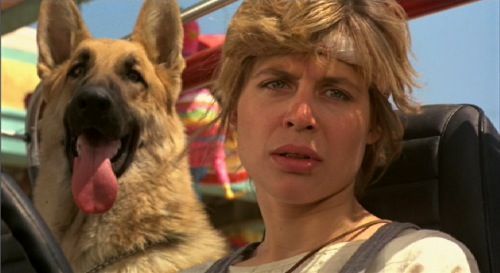 Later, near the end of the film, as a pregnant Sarah Connor heads for Mexico, we see her pet German Shepherd, Max, riding along with her, in the back of her jeep. As she stops for gas a young boy comes by and takes her picture (also showing her German Shepherd), then sells it to her, which later on becomes the property of a young John Connor and also, for a time, John's father, Kyle Reese. Later in T-2 (Terminator 2), Max the German Shepherd, now owned by a tweenaged John and his foster family, can be seen outside their home in a pen. As the T-1000, the bad terminator, takes the form of John's foster mom, Janelle, the GSD can be heard barking furiously outside. Another cool cameo of the use of German Shepherds in Terminator. At just that time John calls to warn the family of the impending doom and hears Max barking furiously and comments about it to the older Terminator he is hiding with. The older Terminator model (Arnold Schwarzenegger) asks for the dogs name, Max, then, speaking in John's voice, asks the Janelle imposter what is wrong with "Wolfie"? When the newer model terminator/Janelle replies that every things okay with Wolfie, the older terminator knows that John's family is dead. 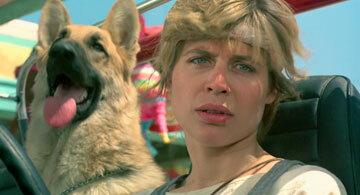 In fact, if you'll really pay attention you'll notice there are German Shepherds in several of the Terminator movies. What a cool little tidbit of information, huh?! So the next time you watch any of the Terminator films: Terminator, Terminator 2, Terminator 3 or even Terminator Salvation, watch out for the presence of dogs in the film and see if you can get a running tab on just how many of them are German Shepherd Dogs. And if you still want to try this theory out even more and see how many German Shepherds in Terminator you can spot, there is always the Sarah Connor Chronicles TV Series to watch and even Terminator comics and novels and fan fiction to read. That should keep you busy for a while!